An InStyle 10 Books You Won't Be Able to Put Down This OctoberSIX FRIENDS THAT BECAME A FAMILY.A TELEVISION SHOW THAT BECAME A PHENOMENON.Today, Friends is remembered as an icon of '90s comedy and the Must See TV years. But when the series debuted in 1994, no one anticipated the sensation it would become. From the first wave of Friends mania to the backlash and renaissance that followed, the show maintained an uncanny connection to its audience, who saw it both as a reflection of their own lives and an aspirational escape from reality. In the years since, Friends has evolved from prime-time megahit to nostalgic novelty, and finally, to certified classic. Ross, Rachel, Monica, Chandler, Joey and Phoebe have entered the pantheon of great television characters, and yet their stories remain relevant still.I'll Be There for You is a deep dive into Friends history and lore, exploring all aspects of the show, from its unlikely origins to the societal conditions that amplified its success. 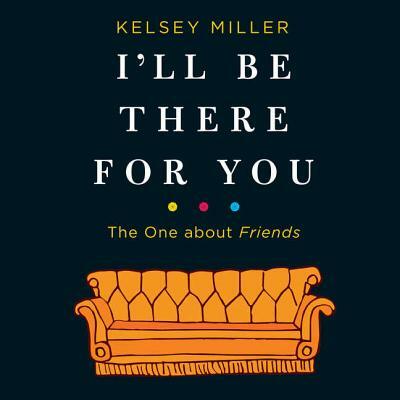 Journalist and pop culture expert Kelsey Miller relives the show's most powerful moments, sheds light on its sometimes dated and problematic elements, and examines the worldwide trends that Friends catalyzed, from contemporary coffee culture to the wildly popular '90s haircut The Rachel. Taking readers behind the scenes, Miller traces the cast's rise to fame and untangles the complex relationship between the actors and their characters. Weaving in revelatory interviews and personal stories, she investigates the role of celebrity media, world-changing events and the dawning of the digital age-all of which influenced both the series and its viewers.I'll Be There for You is the definitive retrospective of Friends, not only for fans of the series, but for anyone who's ever wondered what it is about this show-and television comedy-that resonates so powerfully.